Personality tests are a great way to explore different aspects of who you are, and uncover layers you perhaps hadn’t recognized about yourself before. Being truly self-aware is hard -- while they might not be always 100% accurate, personality tests work well as a starting point for self-discovery by providing results you might not have concluded on your own. There are hundreds of personality tests out there -- some label you with a general personality type, while others delve into your best potential career paths. Some challenge you to look at ink blots, while others ask you detailed multiple choice questions. While many of these tests are unreliable and don’t offer any real scientific validation, others can provide potentially astute, psychologically-based insight into your behaviors, ambitions, and temperament in times of conflict. In fact, some online personality tests are thought-provoking indicators into why you make decisions, who you work well with, and how to modify your attitude towards people whose personalities clash with yours. 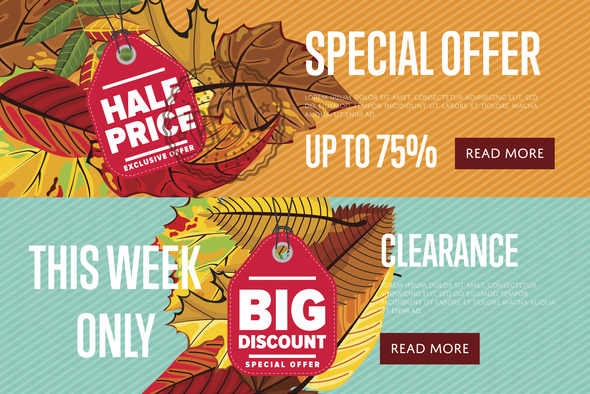 In both your work and personal life, this information can be invaluable. When you’ve got some downtime and want to explore aspects of who you are, or get some guidance on potential career paths, take a look at the best free online personality tests we’ve compiled. Whether you’re interested in general information about your personality, or emotional intelligence-related insight, you’re bound to learn something. Myers-Briggs is a widely respected and popular personality assessment tool -- first used in the 1940s, the test was developed by Katharine Cook Briggs and her daughter, Isabel Briggs Myers. Initially inspired by Jung’s personality theory, the Myers-Briggs test conveniently separates people into 16 categories of personalities, providing each person with a four-letter acronym. The following four tests are broad-stroke indicators of who you are, using inspiration from Myers-Briggs. Among other things, the tests cover your communication styles, your strengths and weaknesses, your desires and ambitions, how you see the world, and how people perceive you. If you’ve never taken a test based off Carl Gustav Jung’s psychological traits, or Myers-Briggs’ 16 categories of personalities, I’d suggest you take at least one of these. 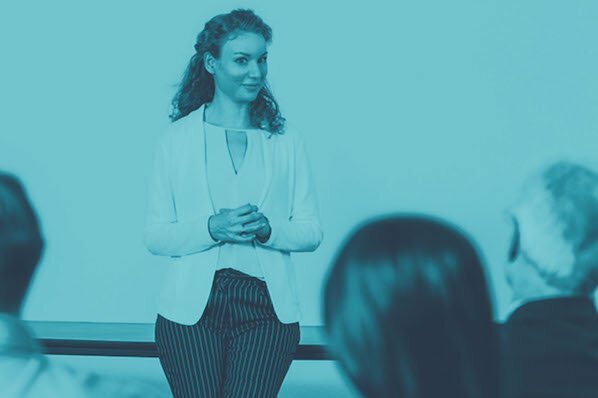 You’ll be surprised by the accuracy of some of the statements, and more importantly, you could gain insight into how your behavior is perceived by others, helping you improve both professional and personal relationships. 16 Personalities covers five broad personality aspects: mind, energy, nature, tactics and identity. The test is based on Carl Gustav Jung’s study of psychological traits (e.g. extroversion vs. introversion) and the Myers-Briggs test, two popular personality theories meant to determine an extensive overview of who you are. Among other things, the test will cover how you communicate and relate to others -- both professionally and personally -- what you value and strive for, and how you make decisions. 16 Personalities has been taken over 126 million times, and is available in 30 languages. Similar to 16 Personalities, Personality Perfect is also based on Jung’s and Myers-Briggs’ personality theories, and uses four broad categories -- extraversion vs. introversion, sensing and intuition, thinking and feeling, and judging and perceiving -- to compile a four-letter abbreviation of your personality type (e.g. “INFP”). 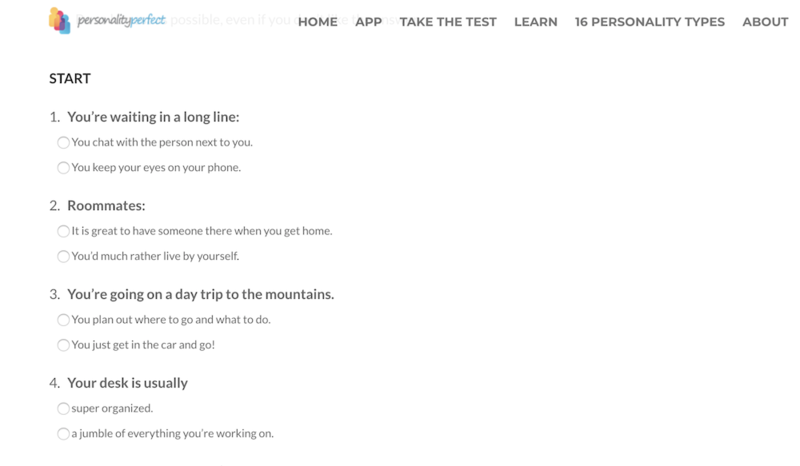 The test provides a broad overview of how you connect with others, how you behave, and, perhaps most surprising, how you’re likely seen by others. 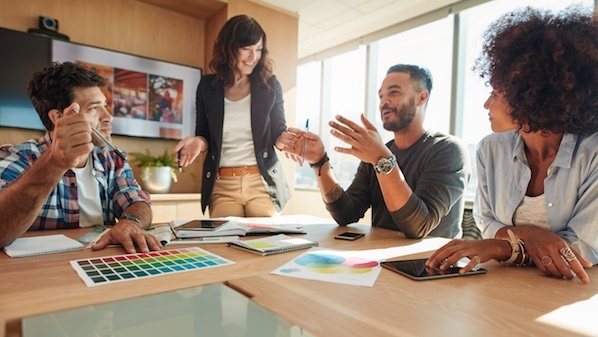 If you’ve ever wondered which famous personalities share your personality type, you’re in luck -- Human Metrics shows you that information, along with your four-letter personality type (again, based off Jung and Myers-Briggs theories). With this test, you’ll get information about which career paths are most suitable for your personality type. If you’re having trouble choosing a career path or doubting the one you’ve chosen, maybe this test can help you figure it out. Test Color, a test validated by a team of clinical psychologists, psychoanalysts and mathematicians, asks you just two questions: “Click on the colors you like most,” and “Click on the colors you like least.” Test Color tells you about your emotional intelligence, your creativity and imagination, your social skills, and your work style, including organization and management styles. 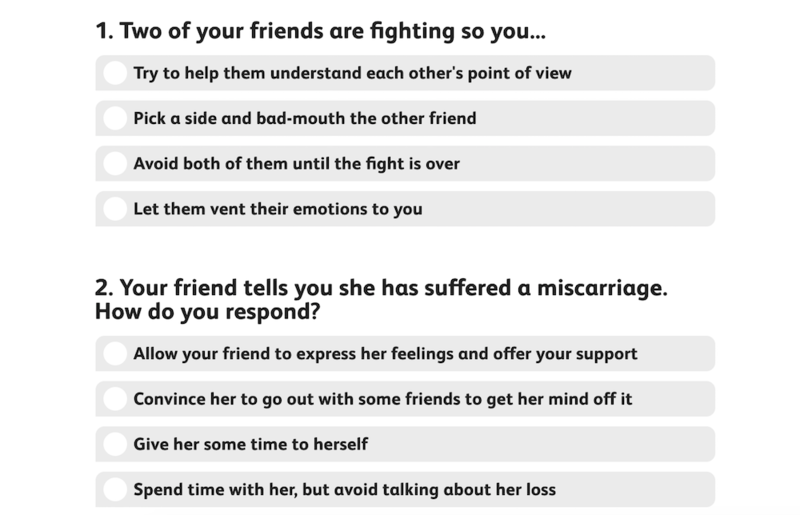 I found it to be surprisingly accurate: in two questions, it nailed how I communicate with others and how I act in group settings. The DISC assessment determines where you lie on four DISC factors: dominance, influence, steadiness, and compliance. 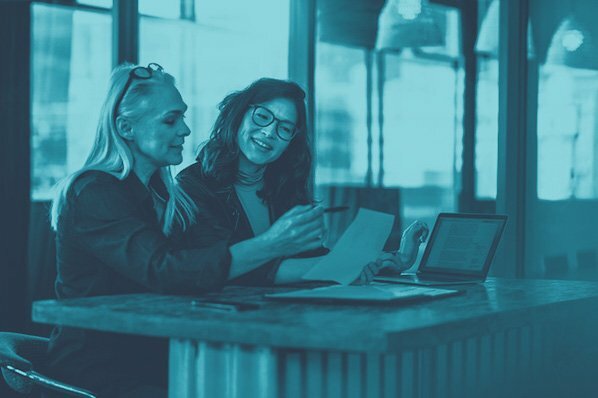 DISC is one of the most popular and authoritative career assessments out there, and many companies encourage their employees to take it. Undoubtedly, personality affects our career ambitions, as well as how we perform in different workplace environments. If you’re particularly extraverted, maybe you’ve chosen a career path that enables you to work daily with large groups of people. If you have certain communication styles that rely on passivity and emotion, perhaps your boss’s direct statements sometimes offend you. Arming yourself with a sense of self-awareness could help you find your optimal career path, foster better work relationships, and mitigate work conflict more effectively. Here are four career-focused tests to help you achieve higher work satisfaction. 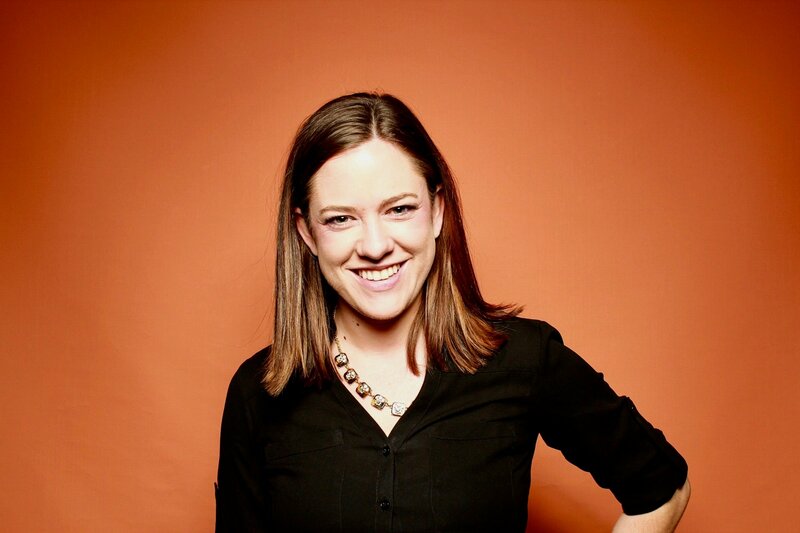 Crystal provides a free DISC assessment, which tells you (among other things) how your personality fits into your work environment, who you work well with, who you might have conflict with, how you perceive other’s behaviors, and how other’s perceive yours. 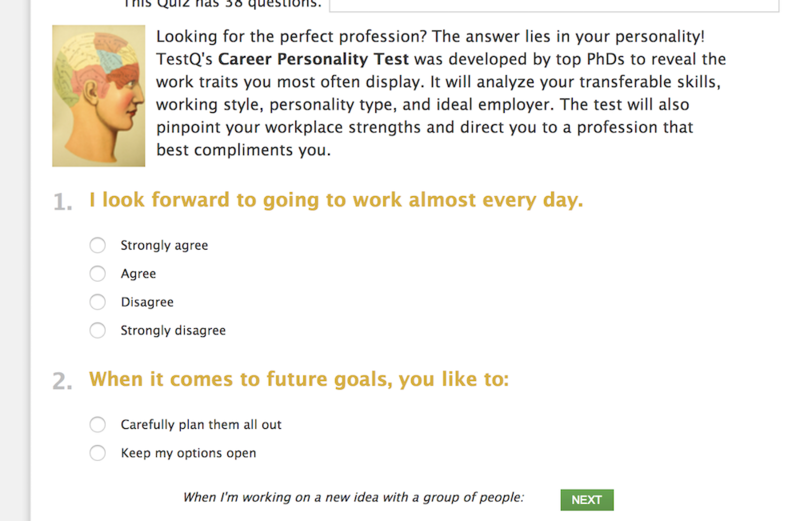 The test helps you understand how your own personality biases you towards certain colleagues (i.e. your personality might take another coworker’s comments offensively, while the coworker just believes in being direct), which could strengthen your work relationships. Best of all, Crystal also offers an accurate personality test, enabling you to build an extensive personality profile on one website. 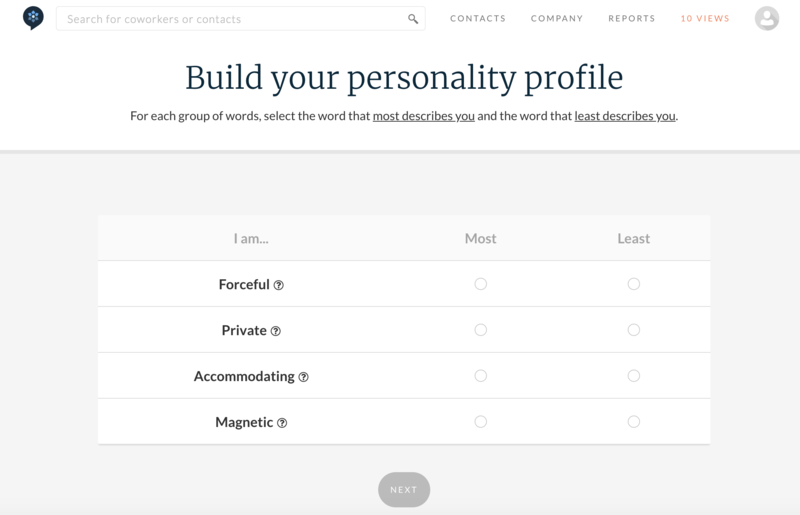 Plus, when you input your company, Crystal lets you see your colleague’s personality profiles -- undeniably critical information when you’re looking to empathize with a coworker. 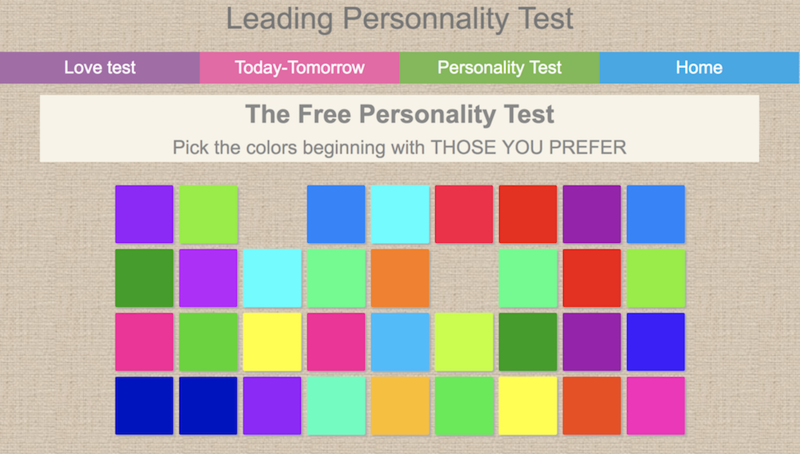 123Test offers a DISC personality test you can take in five minutes, so there’s really no excuses. You’ll get a score to find out which DISC factors predict your behaviors towards other people. The test offers critical information for understanding why you might get along better with one employee, and have more conflict with another. It identifies how you perceive other people’s actions (i.e. “You’re sensitive to her blunt nature, even though she believes she’s just being straightforward”), which can help you improve work relationships. This tests asks 38 multiple-choice questions to analyze your skills, working style, and even your ideal employer. 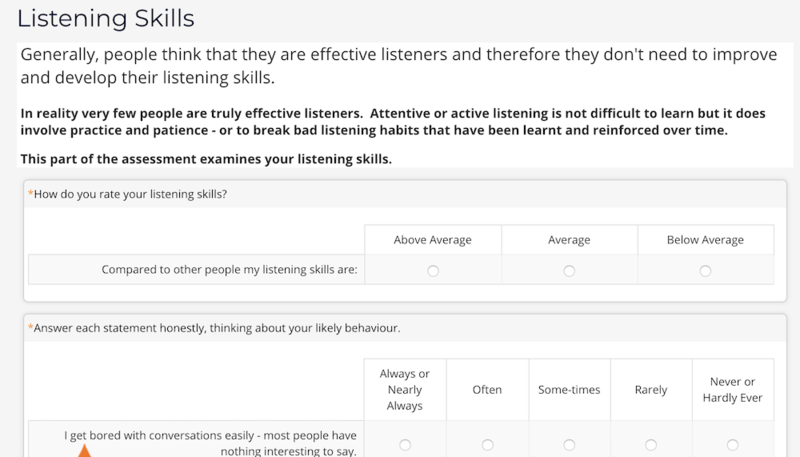 TestQ, developed by top PhDs, offers you insight into your strengths and weaknesses, and even suggests careers best suited for your personality. If you’re happy with your current career track, the test provides suggestions for specific skills you could learn to get ahead in your career. Having well-developed interpersonal skills is critical to forming deep and meaningful personal and professional relationships. Interpersonal Skills assesses your listening skills, verbal communication skills, ability to work in teams, and emotional intelligence. Better yet, the test identifies areas of weakness and provides tactical advice on how to improve those skills. Major companies including General Assembly, NYU, and Redfin use Sokanu, a career assessment tool that tests you on your personality, background, interests, and goals to determine an ideal career path. After you take the test, it provides you multiple matches, which you can sort through to explore different careers and workplaces before choosing an ideal match. Psychology Today defines emotional intelligence as, “the ability to identify and manage your own emotions and the emotions of others.” Arguably, having emotional intelligence is the most important factor in dealing with conflict and communicating with others. It’s undeniable that emotional intelligence is important -- in fact, research has shown success is 80-90% attributable to emotional intelligence (EI), and only 10-20% to your IQ. In the workplace, whether you’re around coworkers in the midst of a stressful project, or dealing with a tough performance review from your boss, it’s critical you know how to both identify and handle your own emotions; it’s equally important you know how to read other people’s emotions, and manage them appropriately. So let’s dive in. Below are four emotional intelligence tests to help you recognize your level of emotional intelligence, and also how to improve it. This test, designed by Berkeley, shows you 20 pictures and asks you to recognize the facial expression on each person’s face. It’s easy, quick, and fun, and an informative way to learn how well you read other people’s emotions -- which is a critical skill for assessing and mitigating conflict. Unlike the tests above, this one is designed to clinically assess you -- the test was developed by Simon Baron-Cohen at the Autism Research Center at the University of Cambridge, and uses the same emotional measurements mental health professionals use to diagnose social impairment. 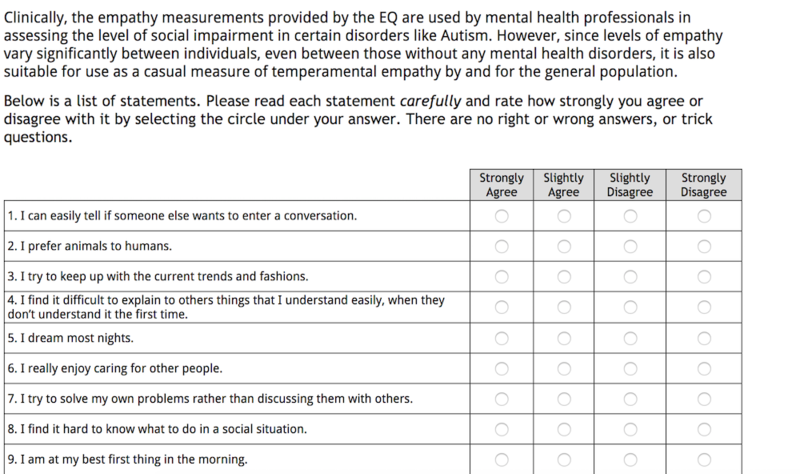 It’s a 60-item questionnaire and is suitable to measure “temperamental empathy” in adults.